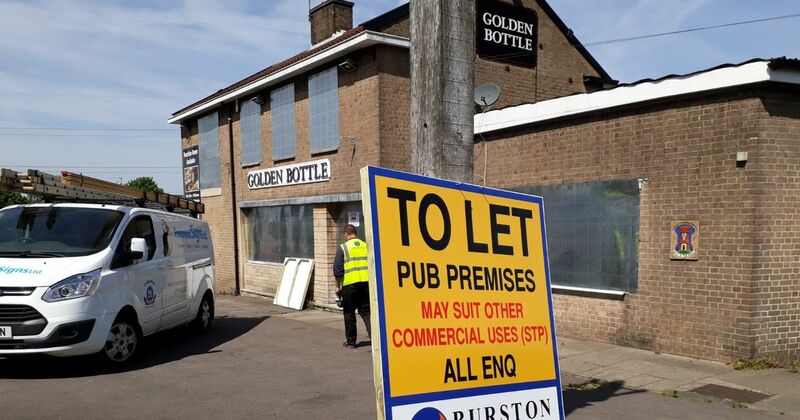 Lockleaze’s only pub, the Golden Bottle, has been closed for nearly two months now and stands on Constable Road with its windows boarded up and a “To Let” sign clearly visible. The people of Lockleaze have been here before with the closing of the Gainsborough/ Blue-Boy and it has become the eyesore that is still holding up development in the Square. Is there anything that the community can do? The Horfield and Lockleaze Voice believes that there is. The Golden Bottle closure could be seen ais a great opportunity for neighbours and families to invest their time/resources into running their very own pub. Few communities in Bristol are given the opportunity to manage their own pub and decide what products/services the pub fulfils. Lockleaze has some experienced community workers to help develop the scheme, along with resources contributed by the Plunkett Foundation and Power To Change. The element that is needed to move this idea forward is enthusiasm/willingness of the community members themselves. If no one comes forward it is likely the asset will be lost, if people do come forward then it is likely that Lockleaze can collectively purchase and run the pub so that its products and services best meet the community using the pub. It provides an opportunity for people power, for revenue to be generated for the benefit of Lockleaze, and enables residents to take command of their local assets. The future of Lockleaze is bright if the existing population come together and decide how Lockleaze can evolve. The best way of maintaining an asset within a given community is for the community to own and run the asset - to ensure that the business is relevant and meaningful to the people living in the area. The Golden Bottle building itself comes with a self-contained flat that would bring an income with it. There is always an option to start a micro-brewery at the same time at the pub; this would produce an income, and employment too. If you feel like you would like get involved or just want to find out more please call into Buzz Lockleaze and leave your details or give them a ring on 0117 269 0006. If there is enough interest a meeting will be called. We would ideally need to register interest by the end of August at the latest and we need people to register their interest and act upon this quickly. More than a Pub is a unique three year programme run by the Plunkett Foundation (see www.plunkett.co.uk/more-than-a-pub) which was established to help support community ownership of pubs in England and grow the range of services they offer to help local people. Its value is £3.85 million and is jointly funded by the Ministry of Housing, Communities and Local Government and Power to Change. It offers the community pub sector access to an end-to-end support programme including capacity building and a finance package made up of loans and grants. Over the last 10 years the UK has lost nearly 8000 pubs - around a fifth of all pubs nationally. For many communities, pubs are not just a place to eat and drink; they are central to people's sense of place and identity and they foster belonging and community cohesion. The programme will increase the number of community-owned pubs that are open and will grow the range of services they offer to help the wider community and address local issues. A wide range of services provided by community pubs could include a shop, post office, library, internet café, cash point, police surgeries, lunch clubs for the elderly, prescription services and informal meeting spaces for a range of community activities. The programme offers funding and support to community groups who wish to take ownership of their local pub and who need help to develop their ideas and plans. They specifically wish to work with groups committed to delivering a pub for the benefit of the wider community.